Hi my lovelies! Just wrapped up filming on a new health video :) Love doing those in particular because I know you guys enjoy them :) It should be up in a couple of days! 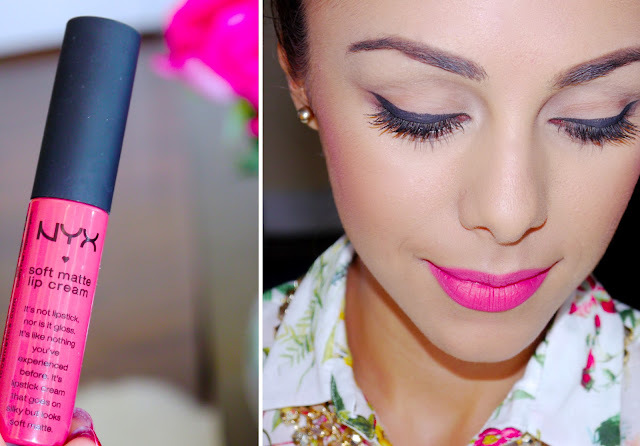 This morning when doing my makeup, I went for this beautiful pink lip color from NYX. It is their Soft Matte Lip Cream in the shade San Paulo ($5.99 at Ulta). These have been out for a while now, so nothing new, but they are very unique in their texture. Just as described on their website, they're not a lipstick nor a lip gloss - but somewhere in between. It applies wet, with a traditional doe-foot applicator, and then sets a few seconds later to a very soft and matte finish which lasts for hours. Another color I love is Amsterdam which is a gorgeous vibrant red as well as Antwerp - a beautiful coral pinky color. love this color! wish they had nyx in Europe! We do have NYX in Europe. I know that NYX products are sold in certain stores in Germany (the chain is called Douglas). Oh this color is absolutely lovely! It reminds me almost of Persian Melon from Revlon's Moon Drops lipstick, but I think this NXY lip cream is even cheaper and probably doesn't smell weird. The color almost matches the flowers behind you too! i have a nyx round lip gloss and i love it! but this color is amazing! Love the color it looks gorgeous on you. I have not try it yet but now that I read your blog blog might give it a try thank you looking forward to your video. There are a couple of on line stores that sell this brand but this lip cream is around 12 dolars! It´s too expensive. You look gorgeous with pink colour!! Gorgeous! I love their Monte Carlo red! It's one of my staples for red lips! Wow this is the perfect color! I think I am going to buuy it as soon as possible, I love matte colors ! i must get this color, it's such a bright pink, perfect for summer! can you make a blog post or video on how to prevent your jewelry from tarnishing? i always see you your jewelry so nice and crispy clean. Beautiful shade, I really want to try these out! Wow, this colour is amazing! looks great on you. You are beautiful! I'm looking forward to the health video! The lipstick color is wonderful! Great color , you look gorgeous! What lip liner would you suggest for the NYX lip cream in Monte Carlo? NEed help. This color looks so much like Addis Ababa rather than San Paolo...unless your camera/lighting makes it looks different. and yours can be one and the same.